To select a size of a control valve, you should calculate the required flow coefficient Cv/Kv for the flow rate and pressure drop. For a specific control valve, flow coefficient Cv/Kv is determined experimentally by control valve manufacturers, and you can found it in manufacturers technical specifications. They express coefficient Cv/Kv as the flow rate of water in g.p.m. [m3/h] for a pressure drop of 1 psi [1 bar] across a flow passage [flow coefficient: Cv-imperial, Kv-metric]. You can use the calculator to calculate maximum flow rate through control valve for given pressure drop and known flow coefficient of control valve Cv. With maximum flow rate calculated, you can compare control valves from different manufacturers for their efficiency for the same nominal size. Control valve calculator is suitable for turbulent flow of liquids. Flashing, cavitation, and chocked flow may reduce the control valve capacity. 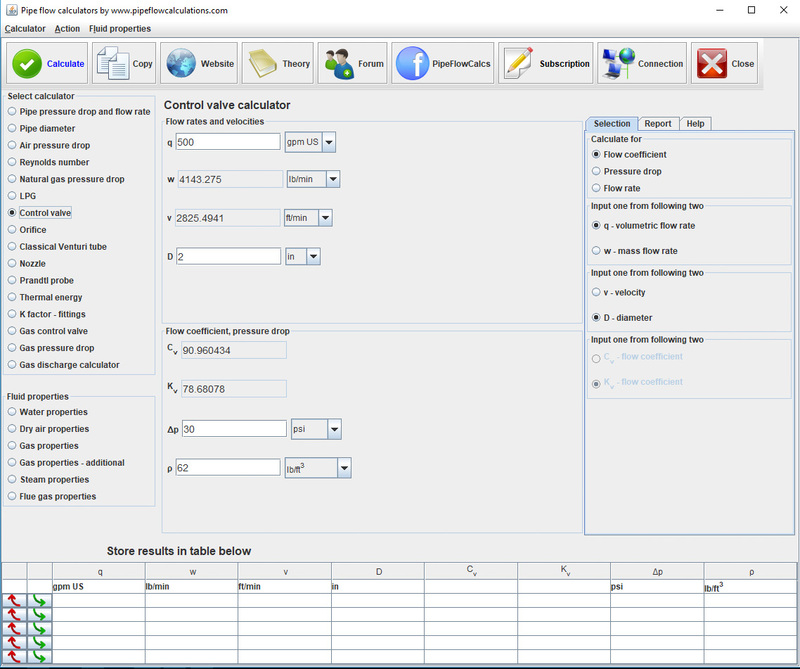 That calculation is not in this version of control valve calculator.